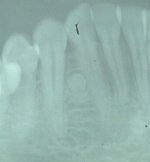 The patient is a 17 y.o. 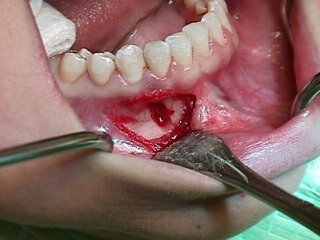 female who presented to our office with a chief complaint of fullness in the right mandibular canine region with crowding and pressure sensations in her mandibular incisor area. The patient has no allergies. There are no serious illnesses. 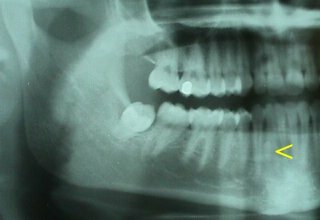 Panoramic radiographic findings revealed a right mandibular radiopaque lesion located between the roots of teeth #'s 26 and 27. Divergence of the roots was noted. 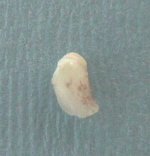 Tooth # 32 was impacted with an operculum.